Though often well-intentioned, protectionism ultimately hurts many of those it is supposed to help. 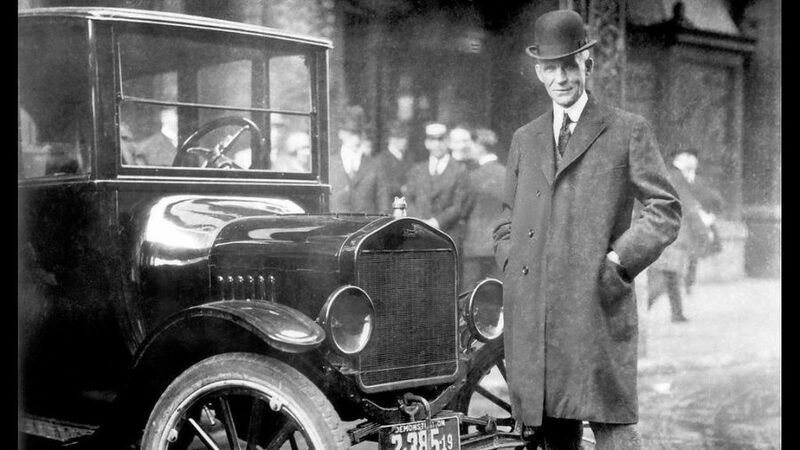 Henry Ford, founder of Ford Motor Company, poses with the Model-T. Ford's invention created wealth and jobs in American society, but the technology enabling that invention came from Germany's Karl Benz. Given the rising hostility towards free trade these days, you’d think that trade barriers had been falling like dominoes across the globe. Not so. In June 2016, the World Trade Organization noted that over the preceding six months the world had witnessed one of the highest increases in protectionist measures in recent years. This outstripped removals of trade restrictions in the same period. Protectionism is clearly on the march. It’s not hard to understand why. The economic change unleashed by free trade is always unsettling for some people, not all of whom are well-positioned to cope. Then there is the fact that free trade’s benefits for millions of Americans, such as falling prices over the long-term, go largely unnoticed by most of us. These difficulties, however, shouldn’t distract us from a major problem with protectionism — the fact that it doesn’t deliver on its promises. Quite the contrary. Technological change has also made parts of America’s economy, such as modern manufacturing, much more productive. That’s partly because machines increasingly perform many of the often highly-repetitive functions once done by humans. For the same reason, manufacturing probably will never again provide the same proportion of jobs for the American economy which it did until the 1970s. The point, however, is that tariffs and subsidies for American manufacturing won’t change that situation because tariffs and subsidies can’t stop technological innovation. Imposing tariffs on other countries to retaliate for their protectionist measures against American products may well hurt those nations. But it also hurts Americans. Second, it’s true that imposing tariffs on other countries to retaliate for their protectionist measures against American products may well hurt those nations. But they also hurt Americans. This is a classic illustration of how the cost of protectionist measures can outweigh any benefits. The same is true of policies that seek to punish American companies who choose to relocate elements of their operations outside America to reduce costs. The moment America starts to do that, other governments would likely retaliate by punishing any company in their countries who might want to invest in the United States or relocate operations to America. Do we really want Japanese car companies that have created almost 700,000 jobs in America by moving many of their operations and factories to America to transfer their facilities back to Japan? Such decisions would mean less foreign investment and business activity in the United States. This means less competition, higher prices, less-efficient resource allocation, and lower productivity for the US. In other words, America loses. There is, however, one group that benefits — albeit temporarily — from tariffs and subsidies: established businesses and those who lobby for them. Free trade isn’t without its downsides. But that’s not a reason to blind ourselves to protectionism’s many flaws. There is an exception: A unprofitable product or business might merit some type of protection because it’s genuinely vital to national security. America is more than just an economy. Protecting national security is a prime responsibility of government. In such cases, the question to ask is whether a tariff or subsidy is the least-costly way of realizing this goal. Such exceptions, however, can’t be the rule. Certainly free trade isn’t without its downsides. But that’s not a reason to blind ourselves to protectionism’s many flaws. In the long-term, protectionism isn’t in America’s national interest. It won’t make America great. Let’s hope we don’t have to rediscover that truth the hard way. This article would be believable if ‘free trade’ were truly free trade. The Chinese have dumped an incalculable amount of products into the the US marketplace which are cost subsidized by their government. US manufacturers cannot complete in such an environment. The steel business is a perfect example. Samuel Gregg … I want to know your thoughts in the case where a foreign country employs slaves, and therefore get a cost advantage. Can tariffs or blockades be justified in such scenarios ? Have to agree with the comments and not the article. What has been going on is not “free trade”. It also hasn’t been fair trade. Renegotiating bad trade deals is NOT protectionism. It’s prudent business to allow us to compete on a level field. I’d rather go back to the way the founders built things, no income tax at all and the feds get their revenue from taxing imports.